Heat oven to 350°F. Make and bake cake mix as directed on box for 24 cupcakes, using colored paper baking cups. Cool 10 minutes; remove from pan to cooling rack. Cool completely, about 30 minutes. While cupcakes are cooling, in medium bowl, beat cream cheese, butter, milk and vanilla with electric mixer on low speed until smooth. Gradually beat in powdered sugar, 1 cup at a time, on low speed until smooth and spreadable. Set aside. Place decorating tip with very small opening (about 1/8 inch) into disposable decorating bag or resealable freezer plastic bag. Spoon jelly into bag. Insert tip into center of each cooled cupcake, about halfway down; gently squeeze bag, pulling upward until cupcake swells slightly and filing comes to top. Wipe tip occasionally to remove crumbs. 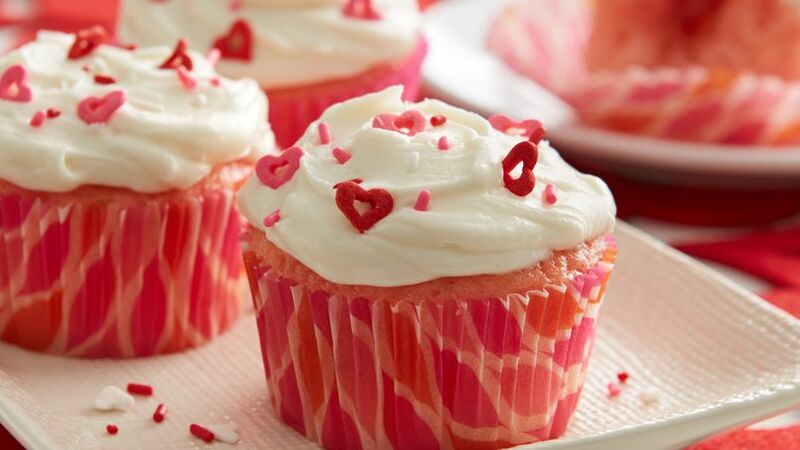 Frost each cupcake with about 2 tablespoons frosting. Decorate with candies. Using strawberry jelly instead of preserves prevents pieces of strawberries from getting stuck in the tip. Want to use for a different occasion? Use different paper baking cups, candies or colored sugars. Do you want to impress your Valentine? You will with these fabulous cupcakes!